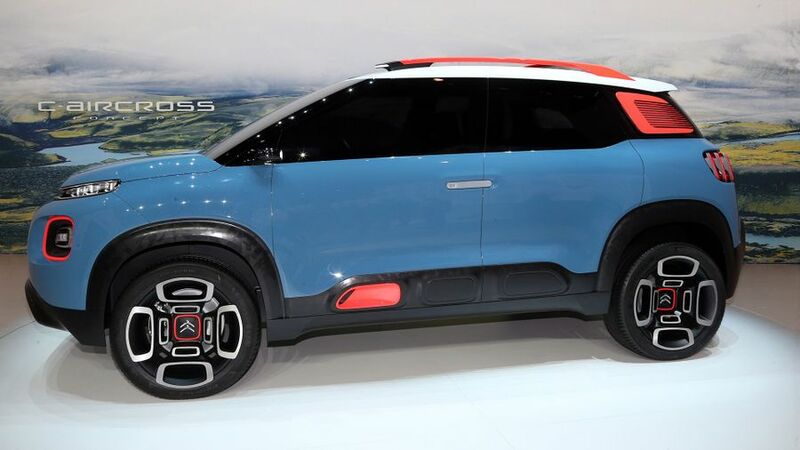 Citroen gave us a glimpse of the future with the C-Aircross, which the company unveiled in Geneva today. Although the car on the stand is officially a concept, it's believed that this gives us the best indication yet of what to expect from the replacement for the current C3 Picasso. We first saw pictures of the concept a month ago, but the car on the stand showed exactly how Citroen is moving the C3 Picasso away from an MPV-like look to something more akin to an SUV. At the same time, the concept also clearly takes some of its inspiration from the C3 supermini. On the exterior, for example, Citroen has kept the bright colours and strong, graphic features of the C3; and, the lower part of the body is highlighted with colour-contrasting ‘guards’. There are plenty of other colour personalisation opportunities, too, including the edges of the headlights, wheel hubcaps, side guards, and the roof racks, which incorporate LED lighting on their tips. Unlike the exterior, the interior is still very much at the concept stage, so many of the aspects of the show car may well not make into production. However, for the record, in the C-Aircross, Citroen has scrapped the conventional instrument binnacle, and instead there’s a colour head-up display, as well as a single-spoke steering wheel with simplified buttons. The centre of the fascia features a 12-inch touch-screen, and Citroen’s ConnectedCam, so you can share pictures of your journey to social media, while you’re driving. It’s all very practical, too, with lots of storage nooks and crannies, including a ‘pencil box’ running the entire length of the dashboard, a double drawer, a large glovebox, handbag storage in the centre console, storage bags on the backs and sides of the seats, and a compartment for wireless phone charging. Although Citroen is yet to confirm when we’ll see the next C3 Picasso for real, we understand that the production version of this concept is expected to be released in summer, with UK sales likely to start before the end of the year. Interested in buying a Citroen C3 Picasso?